The Definitive Publication for Staffing Clients and HR Professionals. Staffing professionals and their clients need to know the facts about co-employment—the relationship between two employers, such as a staffing firm and its client, in which each has legal rights and obligations with respect to the same employees. These employees are typically temporary or contract personnel that staffing firms assign to their clients. Co-Employment reviews the legal and operational implications of co-employment in many critical areas, such as employee benefits, workers' compensation, and labor relations. 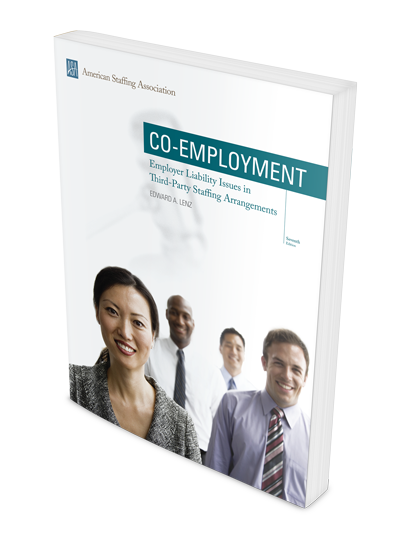 Used as a textbook for the ASA Certified Staffing Professional program, Co-Employment is essential reading for both staffing firms and staffing clients.